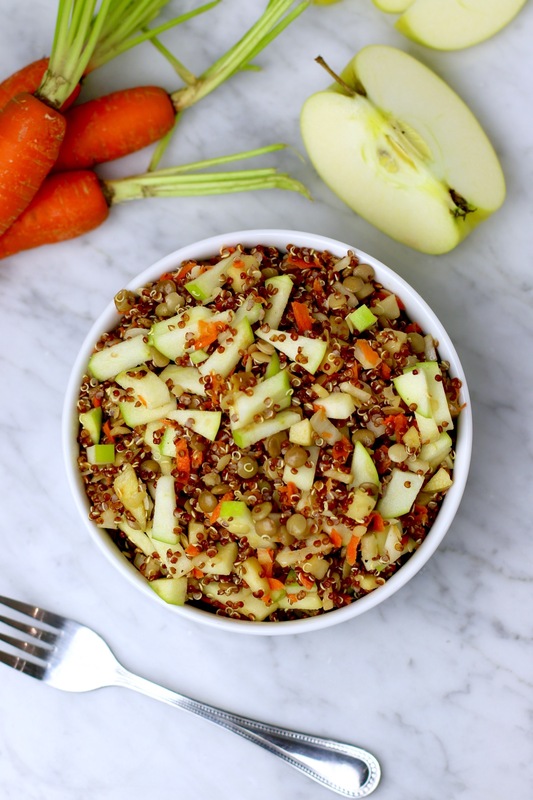 This protein-packed, gluten-free, vegan lentil and quinoa salad is full of flavor thanks to tart green apples and tangy white wine vinegar. 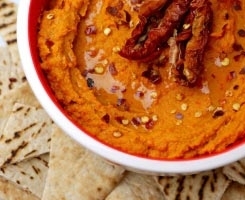 Try it out for your next summer BBQ or potluck! I’ve been attempting to work more plant-based meals into my diet lately. Not only do I simply love vegan/vegetarian dishes (More carbs? Yes please! ), I’m also all for the sustainability, animal-friendliness (is that a word?) and health benefits these eating styles support. Plant-based diets are consistently associated with longevity and disease prevention. To add to the mounting case for me to go meat-free, I learned some very eye-opening information in my nutrition course this summer that may just be the smoking gun I needed to make a change — more on that to come. In the meantime, I’m making small changes to increase the veg in my life. Despite the common misconception that it’s hard to get enough protein when eating vegan/vegetarian, it’s actually quite easy. Beans, grains, nuts, seeds, and even vegetables contain plenty of protein to meet your daily needs. 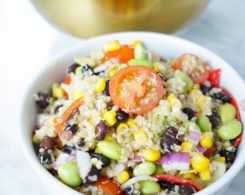 Certain foods like quinoa even contain all nine essential amino acids (the building blocks of protein) that your body can’t make itself and that you need to get from your diet. The hard part can be figuring out what to make. Most people (me included) are so used to planning their meals around meat. When you take animal protein out of the equation, a lot of us are stumped. The key is finding unique flavors. 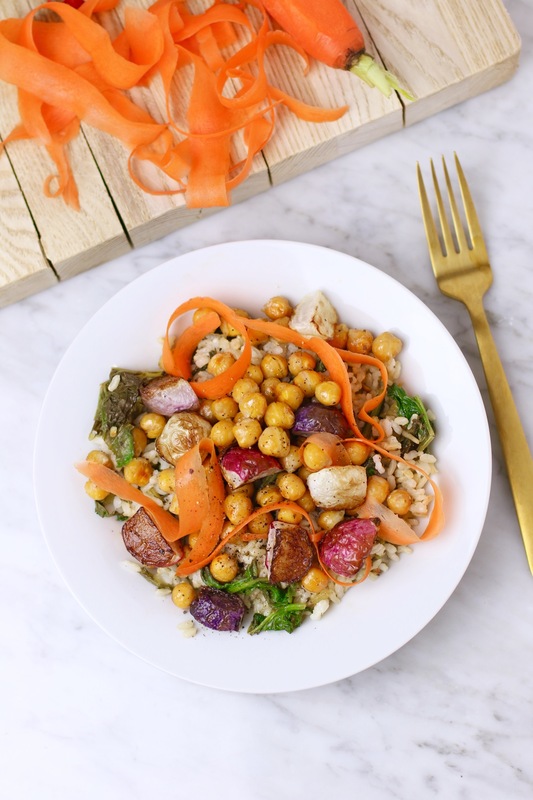 With the right spices, herbs, oils, and juice you can easily turn a boring bowl of rice into a mouthwatering masterpiece. 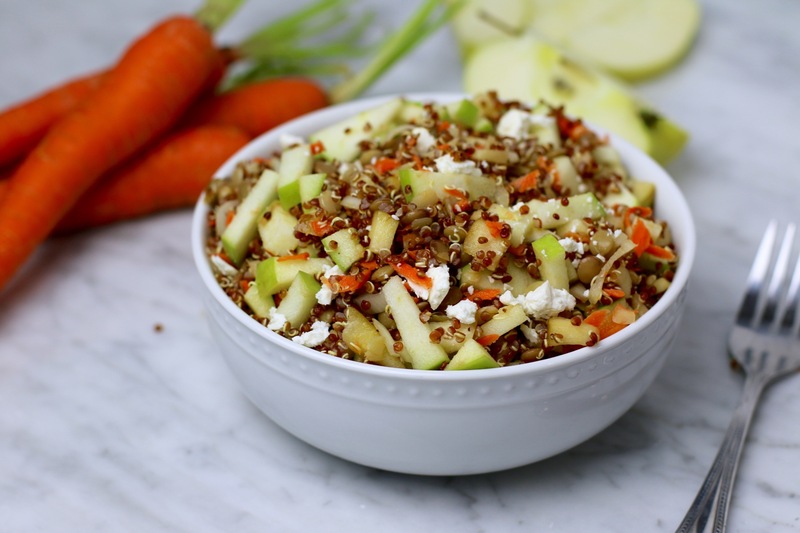 This quinoa summer salad gets its “zing” from tart green apples and tangy white wine vinegar. 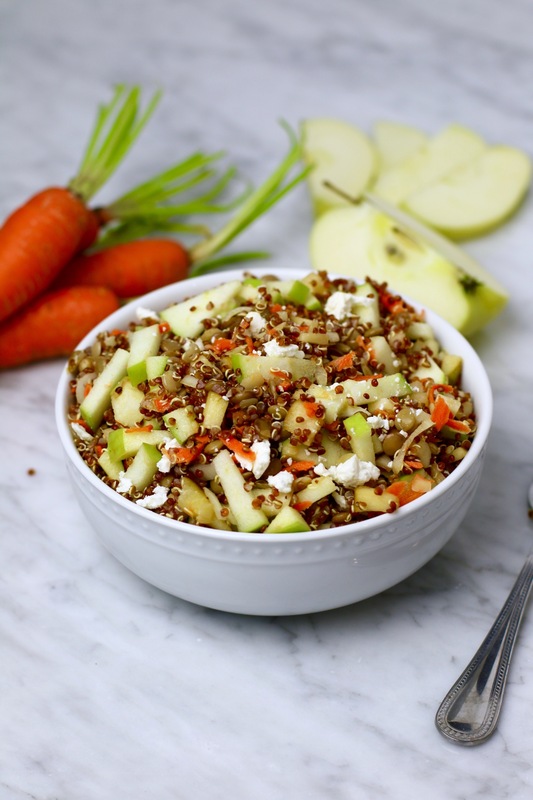 The chewy quinoa and green lentils pack this dish with protein, while the shredded carrots add a nice crunch. All the ingredients are easy to find and relatively inexpensive. Hit up any bulk bin to get the lentils and quinoa on the cheap. 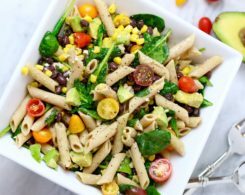 This salad travels well and makes tasty leftovers — I’ve been brown-bagging it to my internship all week! For my lacto-vegans out there, feta makes a delicious addition to this dish. 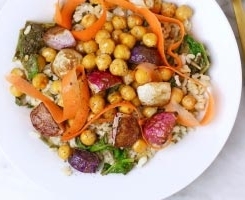 This cool summer salad is a great option for BBQs where most of the food items will likely include charred meat or mayo-slathered side dishes. 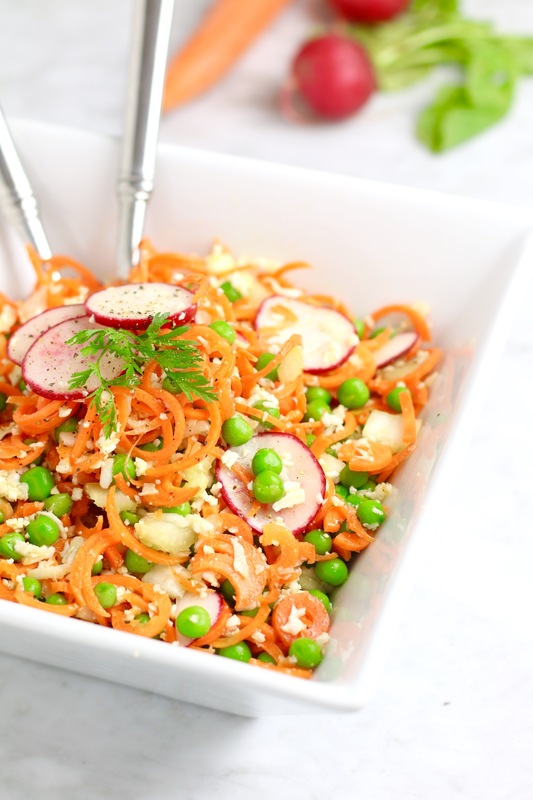 Bring this to a 4th of July bash this weekend and you’ll be the hero of the health crowd! 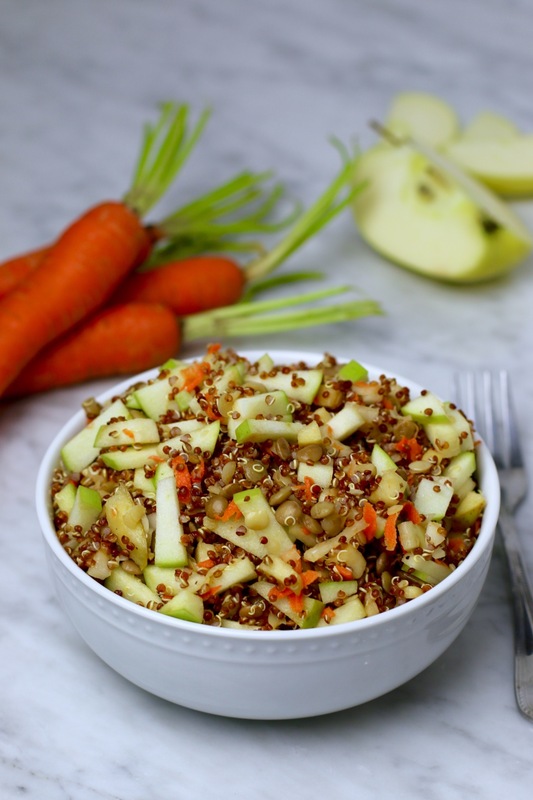 A tangy summer salad made with lentils, quinoa, green apples and carrots. This dish can be made either vegan or vegetarian. 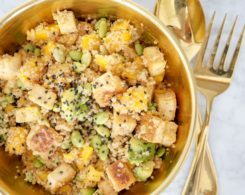 Cook quinoa and lentils according to directions on package. *You can also buy cooked lentils. In this case, use about 3-3½ cups. Weigh In: What’s your favorite dish to bring to summer BBQs? 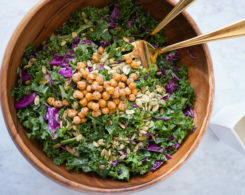 Do have a great plant-based salad to share? Ooooh, this looks delicious! I was just about to search for a new summer salad recipe, and now I have it! Thanks, Whitney! Definitely my kind of salad! DELISH! 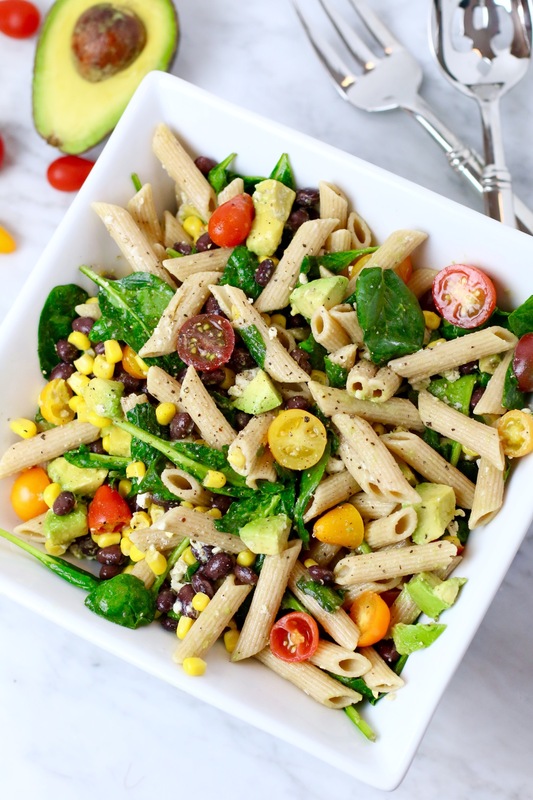 I’m all about incorporating more plant based meals into my diet (we probably looked at similar research) and this salad looks divine! Love fruit in my salads too! Inspired. Making a version of this tonight. Thanks Whit! Thanks for sharing such a light and easy-to-make recipe, Whitney. The salad was great to take at the family brunch we had last weekend. I added some peas as well for a bit of crunch! Hi Maria! I’m so happy you liked the recipe. Peas sound like a delicious addition! I will have to try that next time.